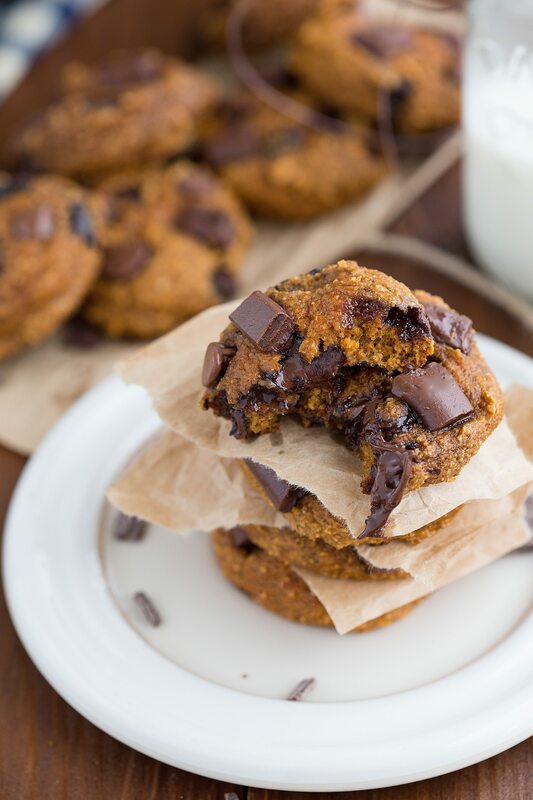 These delicious cookies are gluten-free, packed with protein and good-for-you-ingredients. No white flour, no butter, and no oil in these glazed “apple pie” cookies. Okay, so let’s talk about these cookies. Do they look healthy to you? Yeah, me either. Surprise! They are SUPER healthy! Well, maybe not the glaze so much, but it’s completely an optional kind of thing. Like, a birthday addition for sure! I can’t believe I’ve been blogging for a whole year! It has just flown by and been such an amazing year. I’m super, super grateful for you people that have read this little blog, tried the recipes, and left such nice comments. Seriously, you all are the BEST! <3 And it means the world to me! When I published my first post a year ago, I was so nervous. I knew I was super passionate about food and the prospect of blogging, but I was so worried no one would read my blog (or even like it). Or ever try my recipes. Just ask my husband, I’m pretty sure he had to give me about ten pep talks! Okay, maybe more than ten. Anyways, I’m super grateful for all the support I’ve had! And it’s all thanks to YOU! (I promise we’ll talk cookies soon). I tried a batch with almond butter and a batch with peanut butter. I HIGHLY recommend the almond butter. 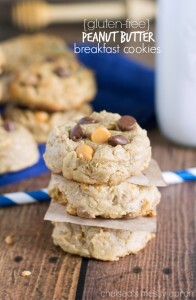 Although these worked with peanut butter, the flavor was overpoweringly peanut butter. With the almond butter, these taste much more “apple-y.” These do work with peanut butter, but they cook a little quicker (about 1-2 minutes quicker). Again, definitely do almond butter and only use peanut butter as a last resort. With the almond butter, I like to get the “roasted” almond butter variety – so much more flavor! I call for oat flour in this recipe. I never buy oat flour in the store, I always just make my own. Which, if you are new to oat flour, may seem like too much work but I promise it’s not!! It’s SO quick. You just take regular old fashioned oats (or even quick oats) and pulse them in a blender or food processor. Within seconds, you’ll have some awesome oat flour. Make sure when you are measuring the oat flour, to measure it AFTER grinding the oats and not before. (The measurements will be very different). This glaze is sugary, but SO good. These cookies are great with or without them, so it’s totally up to you if you want it on it. I made several batches and glazed some for me (I like my sugar) and left some unglazed for the babe. He ate 3 right in a row! If you do chose to omit the glaze, I would recommend increasing at least the cinnamon in these cookies. For the apple – chose whatever variety you like best. Then make sure to peel the apple before grating it. I used a cheese grater to grate the apple and then quickly chopped it into even smaller pieces – this makes sure you have lots of apple in every bite! In a large bowl, beat together the almond butter, brown sugar, and honey. (If the almond butter is cold, don't warm it up or the cookies will spread)..
To make oat flour, simply place old-fashioned or quick oats in a blender or food processor and pulse until they reach a flour consistency. Measure AFTER the oat flour has formed (not the oats beforehand). Beat in the egg. Peel a small apple, and grate it on a cheese grater. Coarsely chop the grated pieces and toss with the lemon juice. Stir in the apple pieces and pecans if desired. Bake for 8-10 minutes. Remove and allow to stay on the cookie sheet for another 2-3 minutes before transferring to a cooling rack. Allow to cool before glazing them. For the glaze: beat all the ingredients together. Either spoon the glaze on, or dip the cookies into the glaze. And, healthy cookies? I am SO into those two words in the same sentence! Pinned! I’m excited about the ebook! I love reading about other people’s experiences with blogging. These cookies look delicious. I love anything with a good amount of almond butter in it! oh my gawd, have you only been blogging for one year?!!! You are a pro and your photos are gorgeous!!! Wow! I am amazed!! Congrats on year #1!!! and LOVE these flourless glazed apple pie cookies. . these are perfection!!!! Congratulations on your bloggiversary, Chelsea! That is so exciting! And I’m loving that you made healthy apple pie cookies. They look absolutely incredible! Pinned and baking soon! And congrats on your soon-to-be Ebook! I can’t wait to check it out! Congrats on the eBook! And on a full year of blogging! I can’t believe your site is only a year old. Can’t wait to see what you come up with in the coming year!! Happy 1 year Chelsea , that’s so exciting! And I can’t wait to check out the Ebook it sounds great! … These cookies are seriously mouthwatering I’m such a cookie girl so the fact that these are so healthy is just awesome! Yummm! Congratulations on one year, Chelsea! I’m so impressed by how much you’ve grown your blog in such a short period of time. 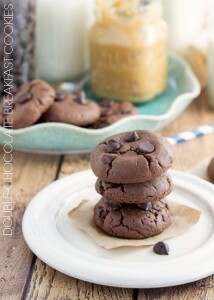 And these cookies look like a delicious way to celebrate! I’m all for a healthy cookie. I think (most of the time) they taste better than the ones loaded with sugar anyway. Yum! I love apple pie, but I think I like this guilt-free version a little bit more! No way! You’ve only been blogging for a year?!?! I would have guessed that you’ve been at it so much longer — you’re awesome, girl! And that’s super exciting about the e-book, too! I feel like there’s SO much to learn when it comes to blogging, and I’m always looking for more tips and tricks so I’ll definitely be keeping my eyes open for that! These look absolutely incredible- you would be fooled to think they were healthy! Big props for a one year blog birthday- I couldn’t tell- it seems like you’ve done it for years- pumped for your e-book release- as a blogger who is in a minority and in a country where it’s just evolving- I’m constantly learning! My goal this week: use oat flour. It’s totally happening! Happy one year anniversary girl!! I can’t believe you’ve only been at it a year! You’re awesome 🙂 These cookies are the perfect way to celebrate! Happy blogiversary! I can’t believe it’s only been 1 year – your stuff is so awesome! These cookies sound absolutely amazing! Can I replace almond butter with coconut butter? Thanks! I haven’t personally tried that substitution so I can’t vouch for it’s work-ability. 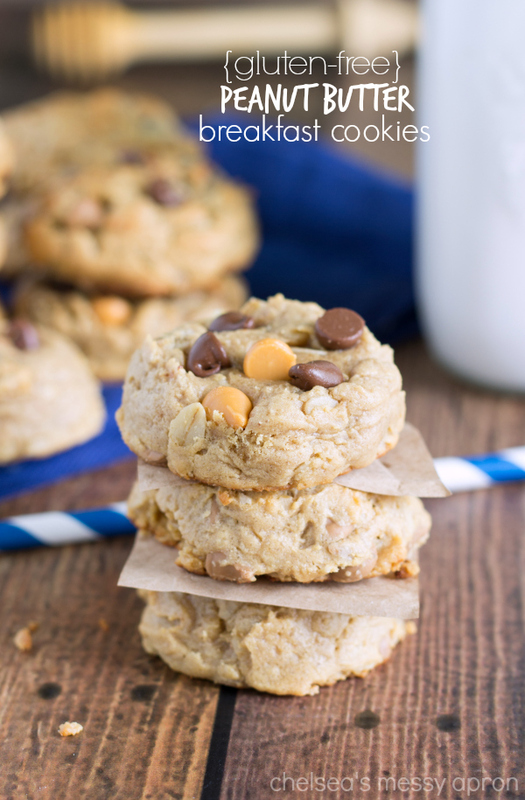 If possible I would stick with the almond butter because it is a pretty important flavor in these cookies. My family loved these! I added organic raisins which made them extra yummy (in our opinion)! I also ended up blending all the wet ingredients in my Vitamix including the apple because I had just made almond butter in it and needed to clean it up. I added the apple in chunks (I didn’t measure, I just peeled and cored a whole apple) after everything else was blended and pulsed until it was how I wanted it. Just thought I’d share for the lazy bakers like me who love a good recipe but don’t like to measure and love to cut corners. =) Thanks so much for the yummy treat! What substitution can I use instead of a nut butter? I’m sorry I don’t know what would work instead of a nut butter since that is pretty integral to this recipe. I love the idea of ‘healthy cookies.’ Thanks for all the work you put into creating these recipes. I do have one problem though – I can’t eat oats! I read a couple of times where you suggested that no substitutions be made. Is there anything you can suggest for me? Hey Sher! I’m so sorry I haven’t ever tried these cookies with anything but oats so I don’t want to give you a suggestion that might not work. Regular flour should work in place of the oat flour, but they will be a lot more wet (oats/oat flour is much more absorbent than regular flour) so you may need more flour or less wet. Sorry to not be of more help. I made this recipe tonight and it was so yummy! I couldn’t find where it said greased or not greased for the cookie sheet but I opted to grease it and that worked great. 😀 These were very different than my usual go to but super good. Thanks! I’m happy you are enjoying them!! Yes they are supposed to be super soft 🙂 You don’t have to store them in the fridge, but I like the best straight out of the fridge! Thank you for opening up a world of oat flour to me! I loved this recipe!! The only thing is that, living in Mexico, any butter other than peanut is impossible to get… So I used pb. And still loved the cookies! Thanks! I love hearing that!! I’m thrilled you enjoyed this recipe 🙂 Thanks so much for the comment Bre! I’ve never heard of cardamom. Which means I don’t have any. Can i just double the cinnamon? Or will it change the taste without it? These look beautiful! Can I use something else in place of the egg? I am excited to try these cookies. I thought I left this question, but now I don’t see it on here… so I’m sorry if this is a repeat. Can I use something else in place of the egg? I’d like to try these cookies; they look delicious! Do these need to be stored in the fridge? How long do they last? We generally bake 2 weeks before Christmas and make a ton of cookies. I’m wondering if they’ll still be good. Thanks! Honestly these cookies are best within a couple of days and are best stored in the fridge. I don’t think these would make it 2 weeks unfortunately. I’ve heard wowbutter works well, but I do think they will be lacking some flavor. Wish I could be of more help! Just found your site, and am wondering (w/out spending too much time reading through… hope you don’t mind): does egg replacer (either potato starch or ground flax seed) work in these recipes? Thanks! I haven’t personally tested or worked much with egg replacers so I really can’t be of much help; sorry Sahari!